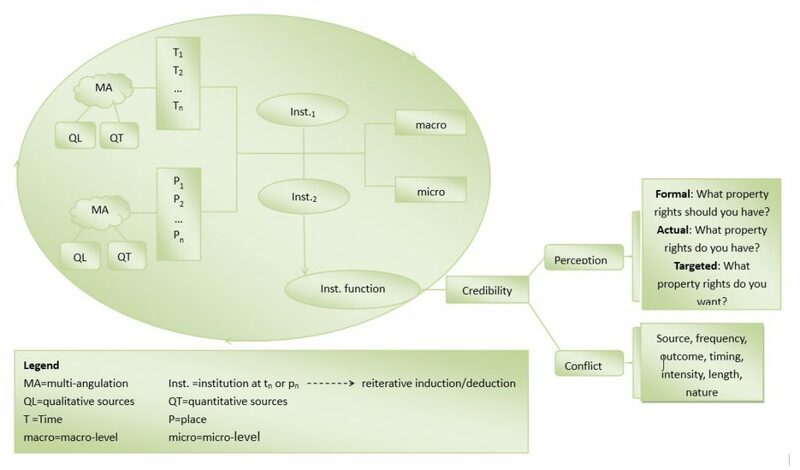 Below is a list of questions and answers about credibility theory, its underlying concepts and methodology. The questions are derived from discussions during various international conferences, seminars and workshops. The answers are derived from Ho’s publications, and are classified in several categories: i) concepts and definitions; ii) theory; iii) methodology; iv) other matters; and v) issues for discussion. The numerous participants of our events are gratefully acknowledged for their lively interaction and stimulating feedback that we’ve received over the years, as well as for their interest in and enthusiasm to help rethinking important issues, such the “credibility of informality”, dynamic disequilibrium, endogeneity, and unintended intentionality. What is the history of the concept of credibility? “[C]redibility was initially coined as an explanandum for the success and failure of Western monetary, anti-inflationary policies in the 1970s (Kydland and Prescott, 1977; Fellner, 1979). The widely flaunted idea was that the success of economic policy ultimately depends on the (state’s) credible commitment to free markets, trade liberalization, the privatization of government-owned enterprises and resources, and legal security for property rights. In this sense, the initial reading of the notion of credibility has a distinct neo-liberal signature. See Peter Ho, “The ‘Credibility Thesis’ and its Application to Property Rights: (In)secure Land Tenure and Social Welfare in China”, Land Use Policy, 2014, Vol. 40, September, pp. 15–16. However, in her critique of the neo-liberal interpretation of credibility, Grabel (2000, p. 1) hit the nail on the head when she stated that “the credibility criterion is used to privilege neo-liberal economic policies and associated institutions.” Yet, at the same time, she made the crucial observation that: “credibility is always secured endogenously (. . .) rather than exogenously by virtue of the epistemological status of the theory that promotes it.” If we conceptualize credibility along this dimension – an endogenous feature tied to the nature of institutions, instead of something that could be accomplished exogenously, the notion becomes devoid of neo-liberal axioms and political convictions.” See P. Ho, “The ‘Credibility Thesis’ and its Application to Property Rights: (In)secure Land Tenure and Social Welfare in China“, Land Use Policy, 2014, 40, Sept, pp. 15-16. What sets credibility apart from trust? “Credibility is different from actors’ “trust” in institutions that emphasizes the relationship between social actors, as for instance, Farrell and Knight, state in an interesting article: “If institutions may exert an independent effect on trustworthiness, and thus on how social actors trust or distrust each other, then it follows that the evolution of institutions may be expected to have an impact on trustworthiness, and thus on trust, and thus on cooperation among individuals (Farrell and Knight, 2003, p. 539). Credibility, on the other hand, draws attention to the nature of institutions and property rights, and to how they are perceived. To understand that nature, one needs to go beyond form and assess the rules in use, what they represent, and what function they fulfill.” See Peter Ho, “The ‘Credibility Thesis’ and its Application to Property Rights: (In)secure Land Tenure and Social Welfare in China”, Land Use Policy, 2014, Vol. 40, September, pp. 16. How is credibility related to intentionality (or agency)? What is Unintended Intentionality? “Endogeneity – as an important premise in Original Institutionalism– holds that institutional structure is not the result of intentional design by which institutions can be “wrongly” or “rightly” engineered. Instead, it emerges in an autonomous fashion resulting from actors’ incessant, multitudinous interactions. Put differently, although actors may have intentions, institutions spontaneously emerge as an unanticipated outcome of actors’ infinite bargaining and conflict; in effect, result from an endogenous, Unintended Intentionality.” See Peter Ho, “Who owns China’s housing? Endogeneity as a lens to understand ambiguities of urban and rural property“, Cities, 2017, Vol. 65, pp. 66-77. What is the definition of an ‘Empty Institution’? An empty institution is defined as “[institutional] compromises over sensitive political issues. The interests opposed to them ensure that they are established in such a way that they cannot achieve their aims, whereas the interests supporting them win a pyrrhic victory as their rules, as represented by the new institution, have no practical impact on social actors’ behaviour .” In: Peter Ho, Institutions in Transition, Oxford University Press, 2005, p. 73. “Its disassociated status allows those governed to generally continue with what they were doing, while those governing can “enforce without enforcing.” The symbolic nature of such an outcome represents an institutional compromise and often features a lower level of conflict.” In: Peter Ho, Unmaking China’s Development: Function and Credibility of Institutions, Cambridge: Cambridge University Press, 2017, p. 204. What is the Credibility Thesis? ” Institutional function presides over form; the former can be expressed by its credibility, that is, the perceived social support at a given time and space.” See P. Ho, “The ‘Credibility Thesis’ and its Application to Property Rights: (In)secure Land Tenure and Social Welfare in China“, Land Use Policy, 2014, 40, Sept., p.14. “The Credibility Thesis posits that “institutions that exist and persist, fulfill a function, and are credible; otherwise they would have fallen into disuse or shifted into other types.” See P. Ho, “An endogenous theory of property rights: opening the black box of institutions”, Journal of Peasant Studies, 2016, 43/6, p. 1126. 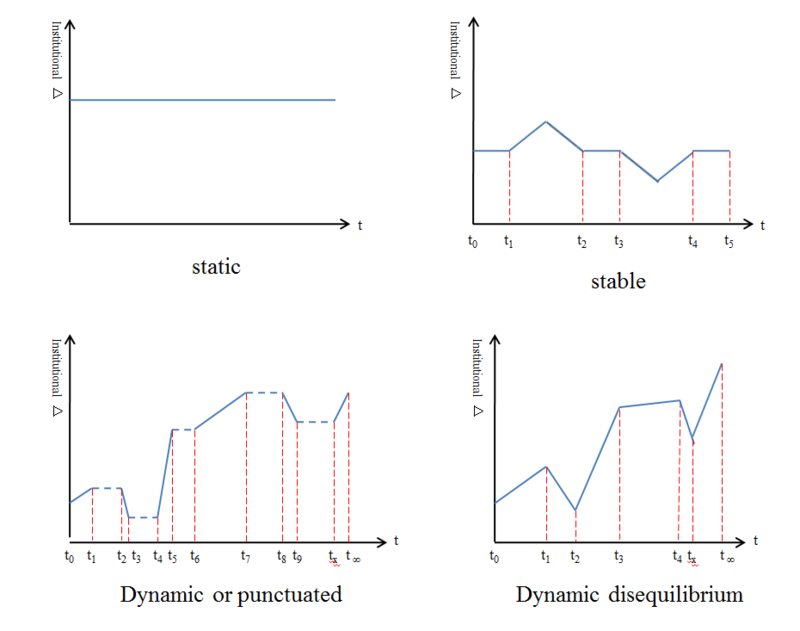 Does the prediction that persisting institutions are functional, imply they are stable? Non-equilibrium, i.e. the premise that institutional change never reaches a state of balance between actors’ interests, power and resources, as tension and conflict is present in any institutional arrangement. How is credibility related to power? “[W]hen an actor forcefully aims to change institutions against the functions that other actors accord to it, the result will be a struggle of power.” See P. Ho, “An endogenous theory of property rights: opening the black box of institutions”, Journal of Peasant Studies, 2016, 43/6, p. 1134. In this sense one should be reminded that: “[O]rdaining and prohibiting belong to a mode of institutional intervention that will only work when the function of what is intended already concurs with what locally exists as actors’ aggregate perceptions. Ironically, … governments often chose ordaining and prohibition in a symbolic demonstration of resolve or to strike deals with other powerholders. The outcome is a contested institution lacking credibility, or an empty institution decoupled from actors’ daily praxis.” See ibid., p. 1141. What differentiates credibility theory’s notion of power from a neo-classical reading? Thus, the idea that formalization and privatization, too, are driven by power dynamics does not play any significant role in the analysis of neo-classically trained scholars, and Acemoglu and Robinson are no exception. By contrast, formalization (and privatization) (…) [are in the credibility view] taken as a fundamental point of departure to study how divergences in power may work out. “Second, in the neo-classical view formalization and privatization are seen as exogenously designable interventions. From there it is not a far step to establish democracy, good governance and human rights in other economies, societies and cultures in the name of freedom, open markets and private property rights.” See ibid., p. 1151. “Yet adhering to endogeneity implies that actors’ action is inevitably followed by reaction, triggering chains of interdependent actions and reactions, that tie an alleged external ‘designer’ of institutions into a spontaneously ordered game in which intentions are inherently watered down into something different or unintended.” See ibid., p. 1151. “Third, in the endogenous view power is not to be seen in moral terms of inefficiency, but in the way it structures institutions into credible, non-credible or empty arrangements.” See ibid. p. 1151. “Ergo, when institutions persist over time and space, they are credible and functional, as they have evolved from a spontaneously ordered evolution, regardless of how that has been engendered by divergences of power. This principle equally applies to the change and extinction of less and non-credible institutions, as apparent through rising levels of distributional conflict, contestation and cleavage.” See ibid., p. 1151. “Secure, democratic, and participatory institutions do not imply that they are credible. Contrarily, neither do insecure, autocratic, and (semi)authoritarian institutional arrangements mean that they are by definition non-credible or empty. In fact, democratic and transparent institutional arrangements, such as codes of good conduct or regulations for Corporate Social Responsibility (or CSR), might actually be disruptive in certain contexts, while autocratic, authoritarian, and non-transparent ones might not. (…) The credibility thesis makes no prediction of institutional teleology, nor does it pass moral judgment on institutional form, as it is concerned with function alone. Yet, the thesis does postulate that one might be able to gauge the extent to which institutions are credible or contested, as indicated – among numerous other indicators – by the level, incidence, and source of generated conflict.” See P. Ho, “The ‘Credibility Thesis’ and its Application to Property Rights: (In)secure Land Tenure and Social Welfare in China“, Land Use Policy, 2014, 40, Sept, p. 23. How reliable are interviews and surveys as a measure of credibility? Interviews or surveys are just but one possible source to assess the credibility, thus functionality, of institutions. It is why credibility theory advocates “multi-angulation” (figure below), the coupling of various qualitative and quantitative, as well as socio-economic, political, legal, historical and cultural sources. Equally important is the way in which the research (be it founded on archival study, agent-based modeling, participatory observation, interviews or surveys) is structured around the variables, which one aims to measure. In this context, the FAT Framework and Conflict Analysis play a critical role. Whose credibility are we talking about? There is a dual dimension to this question. First, it needs to be recognized that conflict is present in any institutional arrangement, credible and non-credible ones. Thus, even when an institution is credible, that does not mean it is harmonious, peaceful and conflict-free. Second, credibility theory makes a distinction between the levels of analysis, and the levels at which institutions emerge. Thus, an institution that emerges between a group of actors at the grassroots level could be credible (i.e. functional) inasmuch an institution that emerges at the national level could be non-credible or empty, and vice versa. Credibility is not a matter of acceptance, it is a matter of what has endogenously emerged from actors’ interactions. In this sense, “[i]t is also vital to see that an institution is spontaneously (i.e. endogenously) shaped and being shaped by different stakeholders. (…) From this it logically follows that the question of ‘whose credibility?’ is not so much of interest for its divergences per interest group – as their perceptions obviously may vary – but from the vantage point of a total, accumulative outcome for an institution. Ergo, the credibility of shared tenancy and the federal reserve is not gauged by merely asking respondents on the (village and city) street, but by probing respondents’ perceptions from all the interest groups that shape and are shaped by its rules, and from it hermeneutically read what its workings are at that aggregate level.” See: P. Ho, “An endogenous theory of property rights: opening the black box of institutions”, Journal of Peasant Studies, 2016, 43/6, p. 1130. Credibility has been described as “a status of two least evils that at times appears stable or stagnant, and at times engenders bursts of explosive development and growth, or upheaval and crisis.” See: P. Ho, “An endogenous theory of property rights: opening the black box of institutions”, Journal of Peasant Studies, 2016, 43/6, p. 1125. What is the relation between politics and credibility? Politics would in the view of the Credibility Thesis be seen as part of the incessant interactions, bargaining and conflict between actors as a result of which institutions endogenously arise (the notion of spontaneous order as put forward by Ferguson, Menger, Veblen, and – surprisingly, on the other theoretical side: Hayek). See: P. Ho, “In Defense of Endogenous, Spontaneously Ordered Development”, Journal of Peasant Studies, 2013, 40/6, p. 1092. What about enforcement? Does informality result from non-enforcement? Not always, but there are examples. For instance, with regards to the titling or privatization of informal housing and settlements, governments sometimes opt not to enforce, although legally prohibiting such arrangements. As a result, the level of conflict is low. This is a typical example of an “empty institution”, because “[p]articularly when sensitive issues are at the center stage of social and political debate, ‘empty’ institutions tend to surface as a sort of institutional compromise. In these situations, institutions can become detached or ‘decoupled’ from social actors’ behavior to avoid conflict. As such, the empty institution is, by and large, ineffective and ignored, yet simultaneously socially accepted, little contested and, in effect, to a certain degree credible.” See P. Ho, “Empty institutions, non-credibility and pastoralism: China’s grazing ban, mining and ethnicity”, Journal of Peasant Studies, 2016, 43/6, p. 1147. This question touches on the eternal dilemma between Institutional Form versus Performance that the Credibility Thesis aims to solve through a refocusing towards Function. For this reason: “One should be careful not to idolize state or common property, lest one commits a mistake to the same degree that neo-liberal and neo-classical thought idolize private property.” See: P. Ho, “An Endogenous Theory of Property Rights”, Journal of Peasant Studies, 2016, 43/6, p. 1138. “Rather than overemphasizing state-led or communal development as a panacea for economic and societal ills, the assembled studies have a fundamentally different story to tell: private property rights are not as important as the neo-liberal, neo-classical paradigms want us to believe, as other ownership types have equally critical roles in development. It all depends on time and place. Yet state, communal and private ownership should never be regarded as a given or precondition, but like any other institutional arrangement, they change endogenously according to the function they fulfill under ever-shifting socio-economic, political and cultural environments.” See: P. Ho, “An Endogenous Theory of Property Rights”, Journal of Peasant Studies, 2016, 43/6, p. 1138. Informality is only accepted inasmuch as it fulfills a function for social actors and economic agents. The fact that institutions are informal (or formal, for that matter), is of no relevance, what counts is the level of credibility (i.e. functionality) that these institutions rally at a given time and space. Thus, the fact that informal housing and land tenure are credible today is not implying that they might still be credible a few years down the road, or in another spatial context. That outcome depends on the interactions, bargaining and conflict of actors that shapes institutions. Is it possible to design institutions? Some would hold that “endogeneity and spontaneous order imply conservatism – that is, preservation of the status quo. Bluntly put, no matter whether informal, customary land rights or child labor is involved, endogeneity allegedly assumes an autonomous evolution in which any development intervention is futile. That is not the message (…), nor is it the case. As aptly worded by Aligica and Boettke (2009, 25): ‘Design and spontaneous order are not irreconcilable’.” See P. Ho, “An Endogenous Theory of Property Rights”, Journal of Peasant Studies, 2016, 43/6, p. 1138-9. “Driven by the use and disuse of their function, institutions spontaneously arise, persist and vanish, much like ocean currents arise, persist and vanish. However, in sailing the currents of development, good seamanship is indispensable, which entails knowing which waters are easy to negotiate, and which waters are not. That knowledge signifies comprehension or, minimally, the recognition of the array and scales of development interventions that can be used, in relation to the endogenous conditions under which they may produce an effect or are likely to fail. In this context, [we put] forward a possible ‘checklist’ for a ‘no-go’ that links levels of credibility to possible intervention and non-intervention. It is hoped that this ‘Credibility Scales and Intervention’ (CSI) checklist can assist policymakers in becoming aware of, and better reviewing, their opportunities and constraints.” See P. Ho, “An Endogenous Theory of Property Rights”, Journal of Peasant Studies, 2016, 43/6, p. 1139. How is credibility related to intentionality (or agency)? Below please find a shortened version of a discussion on informality between PLPR members. “On the question of informal property rights in London, I completed some research a couple of years ago with planning enforcement officers in London. A key issue related to informal property rights for some of these officers was ‘beds in sheds’, a term used to refer to unauthorised properties located within a usually residential plot. These were of varying degrees of physical permanence and quality – some of very good quality and specification – yet all shared the quality of being unauthorised development. Many are occupied by immigrants. (…). “Thanks for this very lively discussion on informality, which just demonstrates all the more that it is a really critical issue. (…) The basis from which our research on property rights starts is the ‘Credibility Thesis.’ In other words, the premise that institutions once they have emerged and persist over a certain period, they perform a function for actors and are thus, in essence, credible. If not, they would have changed or gone extinct. The thesis was formulated in reaction to three postulates of neo-institutional or neo-classical thought, i.e. That institutions can be exogenously designed. That institutional change is characterized by equilibrium. That the form of institutions determines institutional performance. That institutional change is characterized by disequilibrium, i.e. in eternal flux, albeit at varying speeds. That institutional Form follows from Function, and not vice versa. In other words, it does not matter if institutions are private or public, formal or informal, secure or insecure. What matters is their Function or what they do and mean for a group of actors at a given time and space. Chinese rural land lease is highly credible despite its insecurity, as it performs a function for social welfare (a finding also critically underscored by Ben’s research in other contexts). Informal housing is equally credible, as it too performs a function in the provision of social security, i.e. access to the city, education, employment, and health care for low-income groups. The property rights or urban real estate are highly ambiguous, yet, have fulfilled a credible function in propelling China’s explosive property development. “One more author should be mentioned who has engaged rather early in informality/planning/property research in Europe: Paulo Silva (University of Aveiro, Portugal). His latest publication is with Helena Farrall: Lessons from informal settlements: a ‘peripheral’ problem with self-organising solutions, TPR, 87 (3) 2016 doi:10.3828/tpr.2016.21. But what exactly does it mean to pursue informality as a research topic? The whole area is loaded with opposing values. Remember, for example, when Cathy said that ‘in Sydney … no one would want these arrangements to be considered credible, because they violate basic housing standards enshrined in residential tenancies legislation.’ Peter Ho and Chris seem to accept that informal housing exists and examine its economic efficiency or social credibility. But this acceptance does not turn informality into something good. Fortunately, Chris and others misunderstood me (…) and unfolded a very interesting narrative on ‘beds in sheds’ and plotlands. What I had meant, however, was this: If informality yields a premium or is more efficient than formal property, what did Western countries/cities do for the past 200 years? Clearly, the history of Western cities shows a strong sense of moving from the informal to the formal (and students of urban planning are told about the great fires and the hazardous open sewage typical of unplanned cities) (and only a few teach their students that fires and open sewage closely depended on the definition and distribution of property rights in urban land). “Jaywick Sands (and Canvey Island on the other side of the Thames Estuary) and plotlands is the perfect way of connecting informality, illegality and regulation. I’ve always taught my students that these early 20th century English developments are examples of urbanisation in advance of infrastructure, which characterises trailer homes in the USA and informal suburbs in low income countries. They are remnants of a period before regulations required infrastructure to be put in first (…). “In China we are estimating the informality (negative) house price premium (i.e. Discount). So our hypothesis is that people bid a lower land premium for less complete property rights. We have also looked at the question of whether incomplete property rights is less or more efficient than more complete property rights. One of my HKU colleagues has a paper published showing that although people live much more densely in urban villages in China than in formally developed land in a similar location, the aggregate land value in urban villages is lower. This implies that informality is LESS efficient. The question is an empirical one, not a theoretical one. There might be little value in labeling “Formality” as better or superior to “Informality”, or vice versa. It’s because the institutional form of Formality or Informality, for that matter, is derived from a certain institutional function as it has endogenously emerged and persists amongst a group of actors. Formality and Informality are no institutional prerogatives of a “developed North” versus a “developing South.” Thus, we should be careful to depict informality as a treat of China, Brazil and India versus formality as specific to London or Berlin or New York. In fact, I daresay that in a developed context, informality is perhaps as omnipresent as formality. In this context, I’d also like to draw attention to Marja Elsinga’s work on the importance of informality in the housing sector of Western countries. The “certain circumstances”, can most likely be measured as long as we care to delve into the credibility (i.e. functionality) of institutions. In other words, once we aim to assess (qualitatively or quantitatively) actors’ perceptions of institutions and the level of conflict they generate over time and space. Hence, the focus on “FAT” or “the Formal”, “the Actual” and the “Targeted”, and the focus on the 7 dimensions of institutional conflict. Sadly though, that exercise – delving into the Function – rather than the Form of institutions, is oft disregarded, not in the least by decision-makers eager to demonstrate political resolve in dealing with certain socially or morally contested “hot potatoes”.